Markets are on edge waiting for the Fed to raise rates. Conventional wisdom holds that the Fed’s easy money policies have inflated a stock market bubble. When they take away the punch bowl of low interest rates, the stock market will crash correct to long-term average valuations. 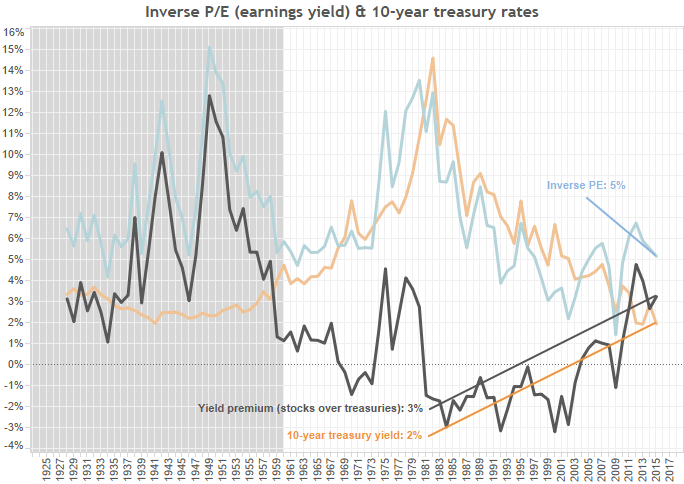 To illustrate, below is a graph showing inverse P/E vs. interest rates. As interest rates go lower, investors’ expectations of yield also drop. Therefore, when the Fed raises rates, voila! Stocks will drop. There’s a big problem with this logic. Low interest rates don’t mean easy money. In fact, low rates are a sign of tighter money. The Fed is stuck between reflating the economy after the 2008 crash to where NGDP growth is high enough for “normal” interest rates, or raising rates now to because they see asset bubbles inflating everywhere. Most miss the point that, for the Fed to truly ease conditions, it has to let the economy get back to trend NGDP growth. Unfortunately Fed policy isn’t driven by long-term ZIRP or trillions on its balance sheet. It is driven by the expectation that inflation is (and always will be) between 0% an 2%. If the Fed signaled it was willing to tolerate higher-than-2% inflation, or if it left rates near 0% even with higher-than-2% inflation, these expectations could shift. In fact, they should shift as we’re not back to trend GDP from the 2008 crash. What would shifting expectations look like? As the Fed left QE alone, eventually we’d see a working hot potato effect. Central bank easing only directly affects bond markets (indirectly it affects everything else). The Fed prints money and buys bonds, driving down yields. Investors then switch to riskier assets like stocks, driving up their prices (and driving down their yields). Indebted consumers can service their loans more easily, which starts to drive up the demand for credit. The more liquid the market, the earlier on it adjusts. Now we have equities and housing going up, portending even larger demand for credit that would (if the Fed doesn’t raise rates to quickly) drive up wages and prices. How does the Fed know it’s policy is working? For an immediate signal, it will look at stock markets. Stocks go up when investors feel like the Fed will let reflation happen. Stocks drop when they worry the Fed will tighten too quickly. If there’s a stock market crash, it doesn’t mean stocks are returning to “fair” value. Based on today’s interest rates, stocks are fairly valued. It would mean that the Federal Reserve is failing in its objective to keep nominal aggregates stable and growing. The crash of 2008 was exactly that sort of signal. Unfortunately the arguments we hear every day, and accept as conventional wisdom, have it only half right. 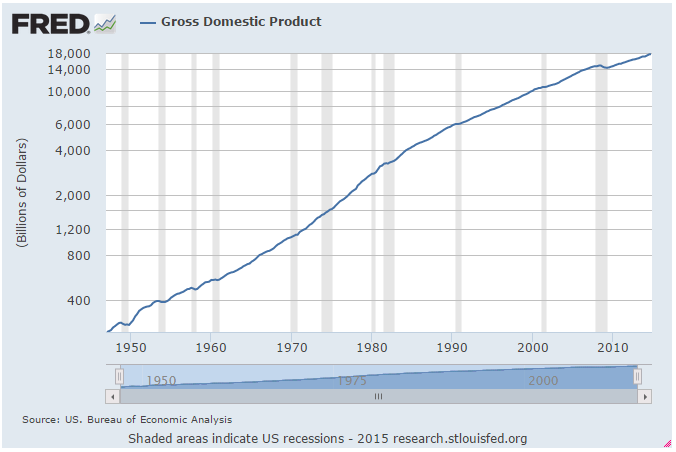 The Federal Reserve does have to keep nominal GDP growing adequately for stocks to remain at their current values. But the Fed isn’t failing by satisfying the financial systems need for liquidity. Everyone is still playing it far too safe, so that liquidity is needed to keep incomes and prices stable (because velocity has dropped). The Fed has it right. The Great Reflation can only take place if it leaves well enough alone, letting the resurgent animal spirits of financial markets move to incomes and prices. And they know that a market crash portends failure. So there is now the Yellen put, and there should be a Yellen put. Otherwise, she’d be steering the overall economy in a dangerous direction indeed.